Orange Alternative (Pomarańczowa Alternatywa) was an underground protest movement started in Wroclaw, Poland, in 1983, and led by Waldemar Fydrych (sometimes misspelled as Frydrych), then commonly known as Major (Commander of the Festung Breslau). Its main purpose was to offer a wider group of citizens an alternative way of opposition against the authoritarian communist regime by means of a peaceful protest that used absurd and nonsensical elements. By doing this, Orange Alternative participants could not be arrested by the police for opposition to the regime without the authorities becoming a laughing stock. Orange Alternative has been viewed as part of the broader Solidarity movement. Initially it painted ridiculous graffiti of dwarves on paint spots covering up anti-government slogans on city walls. Afterwards, beginning with 1985 through 1990, it organized a series of more than sixty happenings in several Polish cities, including Wrocław, Warsaw, Łódź, Lublin and Tomaszów Mazowiecki. It suspended activity in 1989, but reactivated in 2001 and has been active on a small scale since then. The movement carried on avant-garde ideas, with roots going back to Dada. Orange Alternative movement may also have inspired and influenced the Pora and the so called Orange Revolution movement in Ukraine, which was in turn supported by Poland. Major Fydrych and a group of students participated in the Orange Revolution through happenings in Poland and Ukraine. Major Fydrych, Lives of the Orange Men, 2014, Log, PDF. 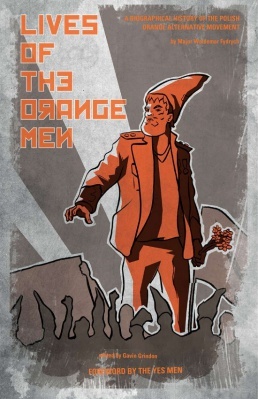 Lives of the Orange Men: A Biographical History of the Polish Orange Alternative Movement, foreword Yes Men, ed. Gavin Grindon, trans. David French, Minor Compositions, 2014, 328 pp. Bronislaw Misztal, "Between State and Solidarity: One Movement, Two Interpretations - The Orange Alternative Movement in Poland", The British Journal of Sociology 43:1 (Mar 1992), pp 55-78. Juliusz Tyszka, "The Orange Alternative: Street happenings as social performance in Poland under Martial Law", New Theatre Quarterly 14:56 (Nov 1998). Padraic Kenney, Carnival of Revolution: Central Europe 1989, Princeton University Press, 2002, viii+341 pp. Introduction,  Reviews: Gerner (2003), Begic (2003, SL), Naimark (2004), Kempny (2005), Kiddey (2011). Lisiunia A. Romanienko, "Antagonism, Absurdity, and the Avant-Garde: Dismantling Soviet Oppression through the use of Theatrical Devices by Poland’s “Orange” Solidarity Movement", Review of Social History 52 (2007) pp 133-151; repr. in Humour and Social Protest, 2008. Jan Przyluski, "Dada Politics / Polityka Dada: Sztuka akcji i ruch Pomarańczowej alternatywy".